Antihypertensive drugs are medicines that help lower blood pressure. All antihypertensive agents lower blood pressure, although the mechanisms of action vary greatly. Within this therapeutic class, there are several subgroups. 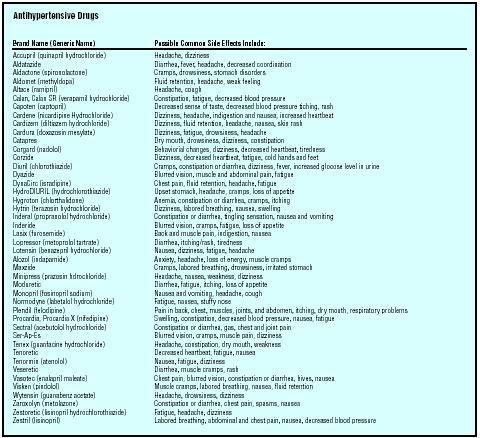 There are a very large number of drugs used to control hypertension, and the drugs listed below are representatives, but not the only members of their classes. The calcium channel blocking agents, also called slow channel blockers or calcium antagonists, inhibit the movement of ionic calcium across the cell membrane. This reduces the force of contraction of heart muscles and arteries. Although the calcium channel blockers are treated as a group, there are four different chemical classes, leading to significant variations in the activity of individual drugs. Nifedipine (Adalat, Procardia) has the greatest effect on the blood vessels, while verapamil (Calan, Isoptin) and diltiazem (Cardizem) have a greater effect on the heart muscle itself. Peripheral vasodilators such as hydralazine (Apresoline), isoxuprine (Vasodilan), and minoxidil (Loniten) act by relaxing blood vessels. There are several groups of drugs that act by reducing adrenergic nerve stimulation, the excitatory nerve stimulation that causes contraction of the muscles in the arteries, veins, and heart. These drugs include the beta-adrenergic blockers and alpha/beta adrenergic blockers. There are also non-specific adrenergic blocking agents. Beta-adrenergic blocking agents include propranolol (Inderal), atenolol (Tenormin), and pindolol (Visken). Propranolol acts on the beta-adrenergic receptors anywhere in the body, and has been used as a treatment for emotional anxiety and rapid heart beat. Atenolol and acebutolol (Sectral) act specifically on the nerves of the heart and circulation. There are two alpha/beta adrenergic blockers, labetolol (Normodyne, Trandate) and carvedilol (Coreg). These work similarly to the beta blockers. Angiotensin-converting enzyme inhibitors (ACE inhibitors) act by inhibiting the production of angiotensin II, a substance that induces both constriction of blood vessels and retention of sodium, which leads to water retention and increased blood volume. There are 10 ACE inhibitors currently marketed in the United States, including captopril (Capoten), benazepril (Lotensin), enalapril (Vasotec), and quinapril (Acupril). The primary difference between these drugs is their onset and duration of action. The ACE II inhibitors, losartan (Cozaar), candesartan (Atacand), irbesartan (Avapro), telmisartan (Micardis), valsartan (Diovan), and eprosartan (Teveten) directly inhibit the effects of ACE II rather than blocking its production. Their actions are similar to the ACE inhibitors, but they appear to have a more favorable side effect and safety profile. mechanisms. By promoting sodium loss they lower blood volume. At the same time, the pressure of the walls of blood vessels, the peripheral vascular resistance, is lowered. Thiazide diuretics are commonly used as the first choice for reduction of mild hypertension, and may be used in combination with other antihypertensive drugs. Sodium nitroprusside (Nitropress) and diazoxide (Hyperstat) are used for rapid treatment of hypertensive emergencies. They are given by vein, often during surgery, to reduce blood pressure that suddenly becomes elevated. Many classes of antihypertensive drugs have been used before surgery to maintain a low blood pressure during the procedure. There does not appear to be a significant difference between drugs when they are used for blood pressure reduction during surgery. Recommended dosage varies with patient, drug, severity of hypertension, and whether the drug is being used alone or in combination with other drugs. Patients should consult specialized references or ask a physician for further information. The warnings and precautions given below apply to the use of antihypertensive drugs over a long period of time. These adverse effects are generally not a problem when the drugs are given as a single dose prior to surgery. Because of the large number of classes and individual drugs in this group, patients should ask their physicians about specific drugs. Peripheral vasodilators may cause dizziness and orthostatic hypotension—a rapid lowering of blood pressure when the patient stands up in the morning. Patients taking these drugs must be instructed to rise from bed slowly. Pregnancy risk factors for this group are generally category C, meaning they may result in adverse affects on the fetus. Hydralazine has been shown to cause cleft palate in animal studies, but there is no human data available. Breastfeeding is not recommended. ACE inhibitors are generally well tolerated, but may rarely cause dangerous reactions including laryngospasm and angioedema. Persistent cough is a common side effect. ACE inhibitors should not be used in pregnancy. When used in pregnancy during the second and third trimesters, ACE inhibitors can cause injury to and even death in the developing fetus. When pregnancy is detected, discontinue the ACE inhibitor as soon as possible. Breastfeeding is not recommended. ACE II inhibitors are generally well tolerated and do not cause cough. Pregnancy risk factor is category C during the first trimester and category D (known to cause adverse effects in the fetus) during the second and third trimesters. Drugs that act directly on the renin-angiotensin system can cause fetal and neonatal morbidity and death when administered to pregnant women. Several dozen cases have been reported in patients who were taking ACE inhibitors. When pregnancy is detected, discontinue ACE inhibitors as soon as possible. Breast-feeding is not recommended. Thiazide diuretics commonly cause potassium depletion. Patients should have potassium supplementation either through diet, or potassium supplements. Pregnancy risk factor is category B (chlorothiazide, chlorthalidone, hydrochlorothiazide, indapamide, metolazone) or category C (bendroflumethiazide, benzthiazide, hydroflumethiazide, methyclothiazide, trichlormethiazide). Routine use during normal pregnancy is inappropriate. Thiazides are found in breast milk. Breastfeeding is not recommended. Beta blockers may cause a large number of adverse reactions including dangerous heart rate abnormalities. Pregnancy risk factor is category B (acebutolol, pindolol, sotalol) or category C (atenolol, labetalol, esmolol, metoprolol, nadolol, timolol, propranolol, penbutolol, carteolol, bisoprolol). Breastfeeding is not recommended. Patients should ask their doctors and consult specific references for food and drug interactions. I take one 120 mg capsule of Cardizem co (Diltiazem) daily & have noticed a big loss of appetite along with a feeling of weakness, constipation, mild depression & mild nausea. has anyone else had severe fluid retention problems caused by the alpha blockers, terazosin or doxazosin? My dad is almost sixty yrs old and has been complaining about getting tired after a short walk.though he claims to have stopped smoking. gave birth 14weeks ago and am presently having blood pressure of 135/100. what medication is safe considering that i am still breastfeeding? Have been taking Micardis 80 HCT for many years. Medicare no longer covers this drug, and cost is prohibitive without subsidies. Is Irbesartan the same type ACE II type drug, and if so what is the comparable dosage?